The Krikor and Clara Zohrab Information Center, together with the Armenian Studies Program of the Diocese of the Armenian Church (Eastern) will co-sponsor an evening of poetry, art and music on Thursday, June 20 at 7:00PM at the Diocesan Center at 630 Second Avenue, New York, NY. 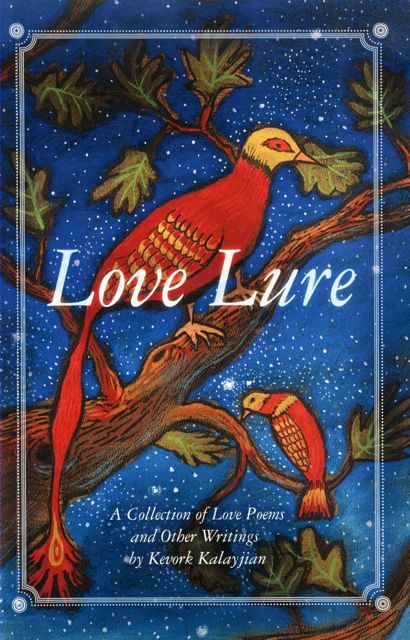 Kevork Kalayjian will read works in English from his recent book, Love Lure: A Collection of Love Poems and Other Writings. His son, Aramazt Kalayjian, whose artwork adorns the book, will also speak. Aramazt’s wife, Ani Jilozian, will offer musical accompaniment on the piano. Mr. Kalayjian will also read some of his newest works in Armenian. Raised in a family intensely committed to the Armenian Church, culture, and intellectual life, Mr. Kalayjian was born in Azez, Syria and graduated from the AGBU Melkonian Educational Institute (Cyprus) before earning higher degrees in Political Science and Economics. His highly acclaimed poetry has been published in Ararat Quarterly Magazine, The Armenian Weekly, and The Armenian Poetry Project. He is also the author of numerous published op-ed essays and letters of a more political nature, most in support of Genocide recognition and prevention. Some of these pieces are reprinted in his book. All are invited to attend the cultural evening, which is free of charge, and which will be followed by a reception. Mr. Kalayjian’s books will be available for purchase. A portion of the proceeds, at the author’s request, will support the work and ministries of the Diocese.